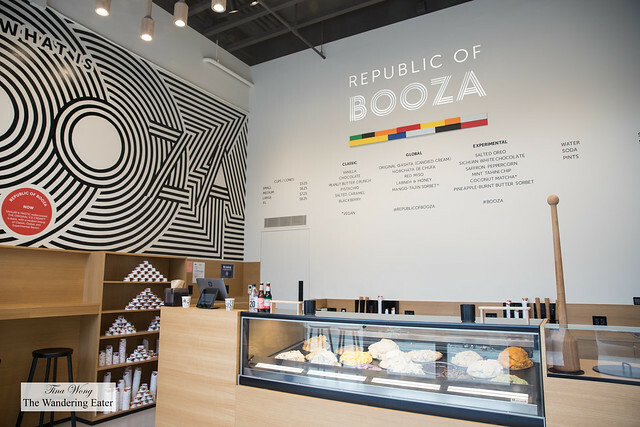 If you want delicious and unique type of ice cream, you should go to Republic of Booza. Booza is an Arabic ice cream known for its stretchy texture and resistance to melting (at regular ice cream temperatures). 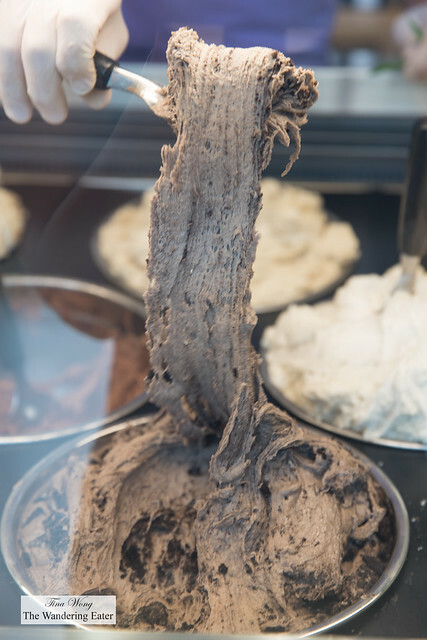 It is claimed to be one of the oldest forms of ice cream, and is most commonly found in the Levant. 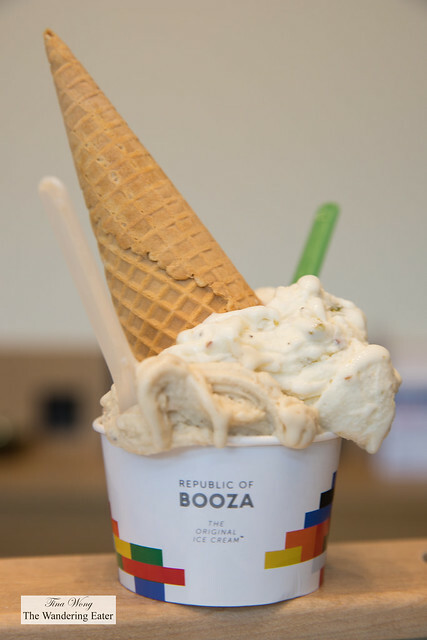 For the most part, booza is made with standard ice cream ingredients like milk, cream, and various flavorings, though it does not contain any egg. The base does get mixed with salep and mastic, however salep is a flour traditionally made from orchid root, and mastic is a resin that comes from the mastic tree in Greece. These are the two ingredients that give booza its signature stretch. It similar to dondurma, a style of ice cream from Turkey that is equally as stretchy. Booza is ideally served between 12 and 15 degrees Fahrenheit. 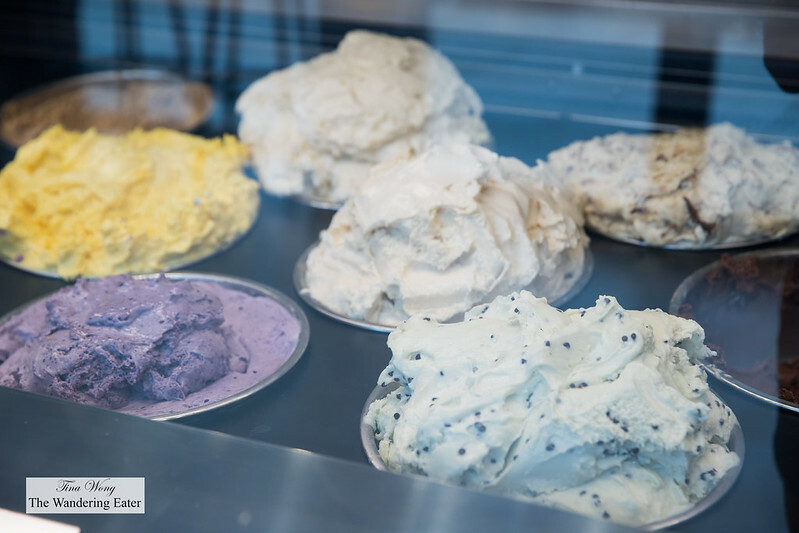 which is about 20 degrees warmer than most ice creams (also makes your taste buds taste the flavors better since it’s not freezing). This is because the booza needs to be agitated or stretched by hand before scooping to get the creamy, non-chewy texture everyone loves. 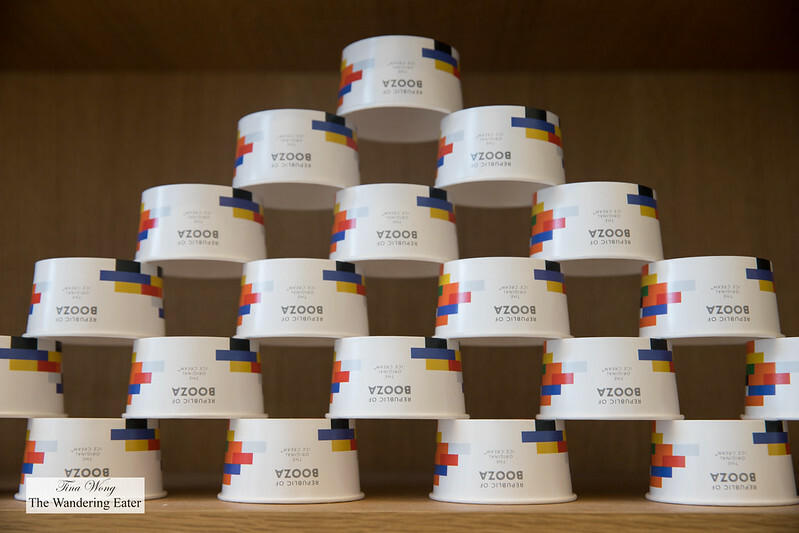 It is less airy than most ice creams, resulting in a dense and compact product. 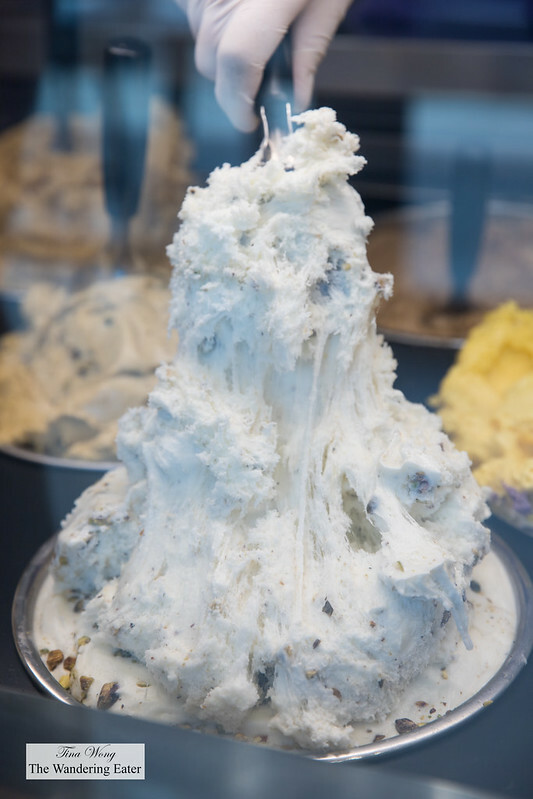 It’s even denser than gelato — frequently the standard for those in search of thicker, more flavor-packed ice creams. 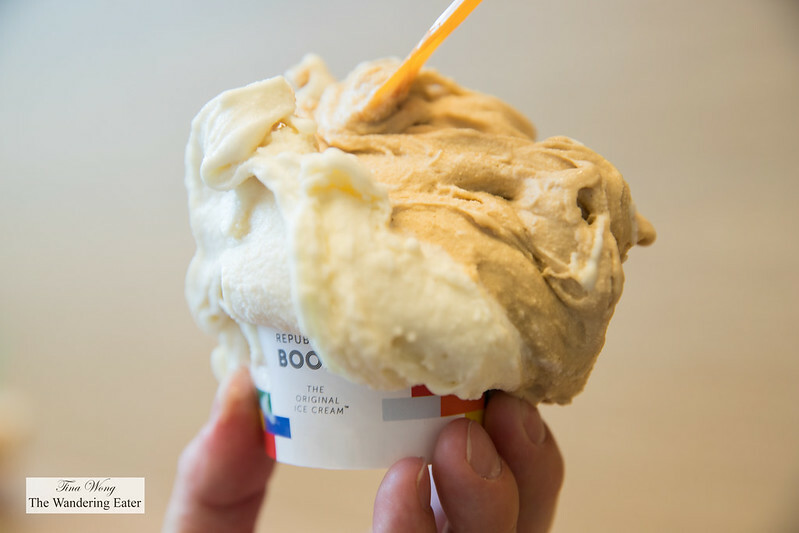 Booza is also more supple than gelato; while booza is stretchy, it’s texture is not rubbery or chewy, but instead it is intensely creamy. 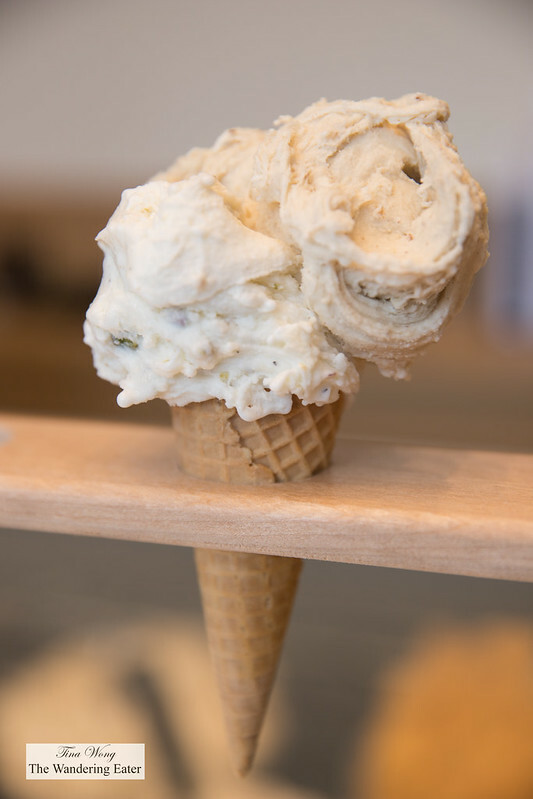 Most importantly, thanks to the salep and mastic, booza melts more slowly than other ice creams, making it perfect for long, hot days with unrelenting sunshine. Republic of Booza is serving traditional flavors like qashta — cream flavored with rosewater and mixed with crushed pistachios — global flavors like horchata de Chufa and alongside more populist flavors likes Salted Oreo and Coconut Matcha. We had a heaping cup of Szechuan white chocolate and salted caramel since they are happy to mix flavors. The Szechuan white chocolate tasted like delicately earthy, floral peppers like a Szechuan peppercorn without the “mala” punch. The salted caramel was not the classic (American) salted caramel you’d taste since there’s an inherent darker flavor since it’s made with panela (an unrefined sugarcane sugar usually found in Columbia) instead of caramelizing granulated sugar. My friend had a cone of original qashta and horchata de chufa. The latter flavor reminded him of his trip to Valencia, Spain a few years ago and definitely tasted like the best horchata I’ve ever had except it’s in ice cream form.